Visitors to petting farms are being warned to take extra care and practice good hand hygiene, following numerous outbreaks of diarrhoeal illness this year. Between January and May 2013, Public Health England (PHE) has recorded 12 outbreaks of cryptosporidiosis, affecting more than 130 people, and as visitors to petting farms reach a peak over the summer the organisation is urging people to take extra care when petting animals. Cryptosporidium is a parasite that can be found in soil, water, food or on any surface that has been contaminated with human or animal faeces. The symptoms of cryptosporidiosis are typically watery diarrhoea and stomach pains. There is no specific treatment for the illness, which is usually self-limiting, although it is important that anyone with the illness keeps hydrated. Over the past 20 years, an average of about 80 cases of cryptosporidium infections linked to visits to petting farms have been reported to PHE each year. 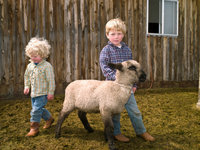 This is out of a total of about two million visits to the 1,000 plus farm attractions in the UK. Dr Bob Adak, head of gastrointestinal diseases at PHE, said: “Visiting a farm is a very enjoyable experience for both children and adults alike but it's important to remember that contact with farm animals carries a risk of infection because of the microorganisms - or germs - they naturally carry. “These outbreaks of illness serve as a reminder for anyone visiting a petting farm of the need to wash their hands thoroughly using soap and water after they have handled animals or been in their surroundings - particularly before eating. Although we can avoid obvious dirt there will be millions of invisible bacteria spread all around the farm which can get onto our hands. “Ahead of the seasonal rise in cases of E. coli linked to petting farms we want to remind people not to rely on hand gels and wipes for protection because these are not suitable against the sort of germs found on farms. Children should also be closely supervised to ensure they wash their hands properly, as they are more at risk of serious illness. Cryptosporidium is only one of a number of bugs that can be picked up during a visit to a petting farm. Other common infections are caused by E. coli and Salmonella. Cases of E. coli linked to farm attractions are at their highest levels between June and October, and an infection with E. coli can lead to mild gastrointestinal illness or in serious cases it can cause bloody diarrhoea which can lead to severe illness.